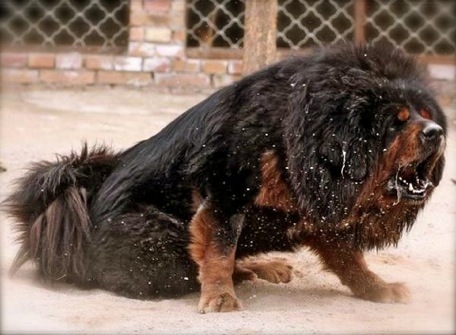 Tibetan Mastiff Dogs, Tibetan Dog: Status Symbol In China? I promise to use it only to send you Tibetan Life. Subscribe To Tibetan Life News! Tibetan Mastiff fever seems to be sweeping through China nowadays. According to USA Today, the majestic breed mainly used to guard herds in Tibet has become the latest craze and status symbol for the wealthiest of China. Purebred puppies can sell for a staggering amount of money in China. ‘Celebrity’ breeders of the royal dog can make hundreds of thousands of dollars a year and don’t even have to sell many pups for that. One mastiff can go for tens of thousands easily. In September this year, a woman in Xi’an actually spent over $500,000 USD on an 18-month-old beauty, and had the dog flown in to be greeted by a 30-car convoy at the airport. A wider rise in pet ownership in China is credited with moves toward more effective animal welfare laws, although some advocates are opposed to mastiff fever. ‘It’s cruel to let them leave their habitat,’ the head of Beijing’s Animal Welfare Association tells USA Today. ‘We should send all of them back’ to their native area. My Little Mystery Book- 99¢!